We have reached the turning point in Mark’s Gospel. 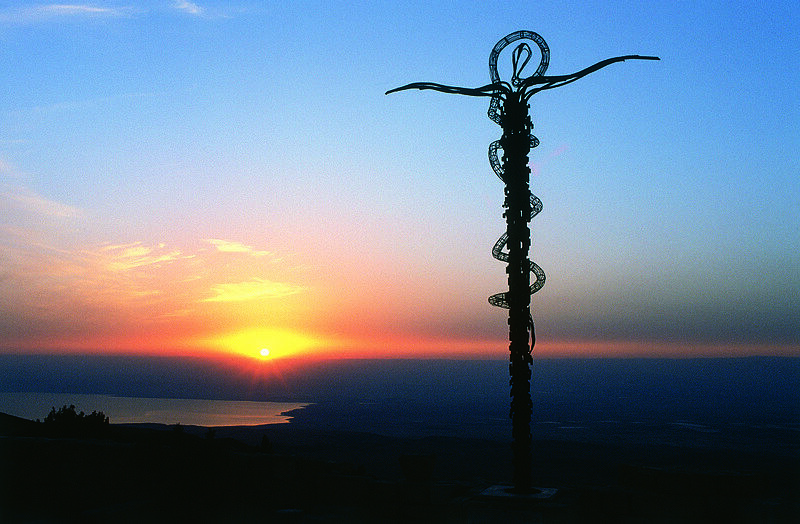 Now Jesus begins to talk about his destiny in Jerusalem – to be crucified and raised. It’s not hard to foresee that he will be crucified. He is challenging Rome’s claim to dominion over human life. He is denying that Caesar is the savior of humankind. He is announcing the dawning reign of God – and even his followers think of the kingdom of God in terms of the restoration of the Davidic monarchy and the nation’s deliverance from all foreign oppression. Rome meets all such claimants with the torture and shame of the cross. But Jesus has a much more profound revolution in mind. The prophet, in the reading from Isaiah on Sunday, is rejected by his community – but the LORD is the one who has given him the message to speak and will be his vindication. It is an appropriate choice for Jesus who will also be rejected by the leadership of the nation but vindicated by God. The psalmist sings of God’s deliverance and uses words in which the Christian community finds hints of resurrection: “you have delivered my soul from death…I walk before the Lord in the land of the living.” Though the disciples do not yet grasp what Jesus is talking about – though they do not yet see fully – the hints of God’s remarkable work are sprinkled like Easter eggs through the Old Testament for those with eyes to see. So we begin our Gospel reading on Sunday with the story of the blind man. Jesus heals his eyes but, when asked, he says “I can see people, but they look like trees, walking.” It takes a second act of healing to help him see clearly. So it is when Jesus speaks with his disciples – they can see that he is the anointed, the Christ/Messiah, but they do not yet see clearly. They do not understand the cross and resurrection. The prophets like Elijah or John boldly challenged the evil they saw in their society, but Jesus is more than a prophet. Jesus is on a mission not to combat evil but defeat it forever. but stumble over the mystery of the cross. but to be found in your son, Jesus Christ our Lord. “I gave my back to those who struck me, and my cheeks to those who pulled out the beard.” – The prophet is rejected by his community but it is God who has called him and will deliver him. “The snares of death encompassed me; the pangs of Sheol laid hold on me; I suffered distress and anguish. Then I called on the name of the Lord: ‘O Lord, I pray, save my life!’” – The poet praises the LORD who delivered him from death. “No one can tame the tongue–a restless evil, full of deadly poison. With it we bless the Lord and Father, and with it we curse those who are made in the likeness of God.” – The author warns the community about the power of the tongue and reminds them that we cannot bless God and curse others. There is a turn in this psalm, as in so many psalms of lament, when the poet moves from his despair and grief and bitter plea to exultation and joy. We are reading, Sunday, from that joy. When the followers of Jesus searched the scriptures to understand what had happened to the one they confessed as the Christ, words like this must have exploded off the page with new meaning, pointing far beyond the poet’s original sorrow to the world’s ultimate sorrow. It is not a cry of triumph, like all the fans of a team pointing their forefingers into the air after a victory to declare they are number one. It is rather a profound confession that in the story of the crucified and risen one we will remember. We will remember who we are. We will remember the God who made us. We will remember the love that vibrates in and through and around all creation. We will remember how we have turned away from the source of life. We will remember the horrors we have done. We will see in the pierced hands of Jesus the pierced hands of all our sisters and brothers who are crucified by violence and neglect. We will remember it all: our true identity, our terrible path, and the way home. We will remember and return and kneel before him who is the font of grace and life. We will worship: we will remember and sing praise, we will remember and give thanks, we will remember and adore. And what awaits all creation is what we do on Sunday mornings when we gather to break the bread and sing the songs of joy. 2 He is the atoning sacrifice for our sins, and not for ours only but also for the sins of the whole world. In John’s Gospel, Jesus is crucified at the hour the lambs are slaughtered for the Passover. In John’s memory – or in his theological reflection on the meaning of Jesus’ death – it is not the Passover meal when Jesus arises to wash his followers feet. It is the night before. And the day he is sacrificed, is the day the lambs are sacrificed. He dies as the lambs died, to redeem the nation from death. Whether John’s account is memory or reflection, the power of the imagery is impossible to miss. 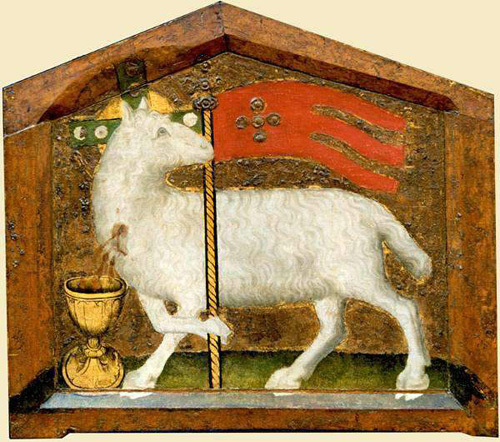 Christ is our Passover lamb. In the imagery of the Book of Revelation, he is the lamb who was slain standing in the center of the throne. “He is the atoning sacrifice for our sins,” writes the author of 1 John. And with those simple words we are reminded of Christ our Passover Lamb whose blood marks the door and saves us from death. “For the sins of the whole world.” He is the atoning sacrifice not only for the shame we bring upon God for our pedestrian selfishness – the occasional greed, thoughtlessness, selfishness, betrayal that’s so much a part of ordinary human existence – but for the great shame of fratricide that has plagued us since Cain rose up against Abel: the slaughter of other children of God in the name of God, wealth, power, ideology and simple hate, envy, and vengeance. Unspeakable crimes from every beaten woman to every segregated fountain, from every raped child to every tortured prisoner, from every neglected elder to every stolen pension, from every death camp to mass grave. Unspeakable crimes against humanity. Unspeakable crimes against the children of God. Most of us are likely to excuse our own petty sins. We don’t imagine they need real atonement. And for those other sins we imagine there is no atonement, no way to make it right. But before us stands the cross, the nails, the scourge, the thorns, the grave. Before us stands the stone rolled away. Before us stands the risen one with wounds. 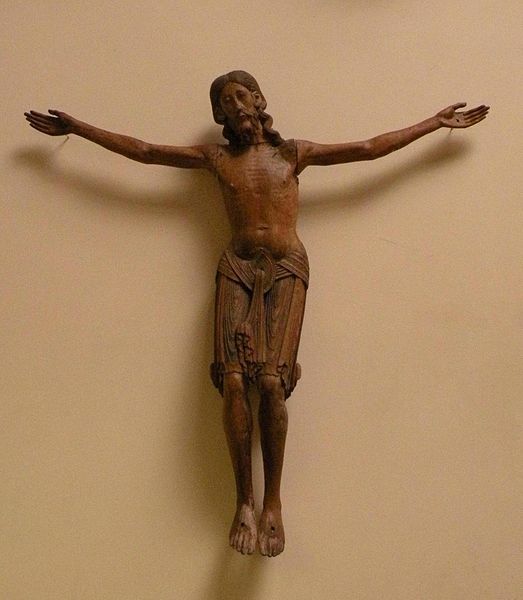 And in our hands is the broken bread – the sign of his broken body. Broken for us. Broken for the world. The whole world. Our hands should tremble as we hold it. We gather to begin our observance of the three days on Thursday evening. There is a prelude that night and a confession and forgiveness – but the dismissal to “Go in peace,” and the postlude doesn’t happen until the end of the liturgy on Saturday evening. This is one great celebration in several acts over the three days. Thursday we begin with a confession that connects to the ancient practice of the church when, on this night, those who had been under the public discipline of the church were reconciled. It is a good word with which to begin: we walk through these days as those who have been cleansed. “Though your sins are as scarlet, they shall be white as snow.” We are gathered as a forgiven and reconciled people – a forgiving and reconciling people. And so in the Thursday liturgy the forgiven/reconciled, forgiving/reconciling people hear Jesus speak the new commandment to love one another. We hear the splashing water and wrestle with that image of the living Christ at our feet as the paradigm of our life with one another. We encounter the Christ whose body is broken like bread, whose blood is poured out like wine. And we see the altar stripped as Christ was stripped of all honor and led away in the night. Friday in that last hour of Jesus’ life we hear the prophet Isaiah speak of the one who was wounded for our transgression and John describe the one who was lifted up in the hour the Passover lambs were slain. We listen and we adore and we pray for a world in need of his voice. Saturday evening we gather to follow the light of the world through the darkness, we hear the great stories of salvation – and water again, this time the washing of baptism with all its echoes of passing through the Red Sea out from slavery into freedom. And then the Cry goes out: “Christ is Risen!” and the table of Maundy Thursday becomes the banquet of heaven, the foretaste of the feast to come. In the full light of Easter morning we sing the great hymns that belong to a people who have come through the waters from darkness into light, from the realm of death into the realm of life. In Detroit, one year, when the girls were young, I stopped at a party store for milk on my way home after the evening service on Good Friday. The man in front of me bought a bottle of cognac, received his change, and started to walk away when turned back to ask for two glasses. He was given two small plastic disposable cups, presumably to sit in a car in the lot and drink with his girl. I was struck by the contrast that night between the faith community gathered in prayer on this holiest of days, and the guys hanging and drinking outside the store knowing only this was a Friday night. One group praying for the life of the world and the other thinking it was found in a bottle. Most of the world will not care what we do these three days. But the one they do not see is the world’s true light and life. revealing your will and your way. we may prove faithful to you and to all. in the shadows of the night we hear the echo of your voice. Help us hear the prayer, trust its promise, and know its healing. in lives faithful to you and to all. and encounter all people with the promise of life. may be united in faithfulness and joy. Image: He, Qi. He is Risen, from Art in the Christian Tradition, a project of the Vanderbilt Divinity Library, Nashville, TN. http://diglib.library.vanderbilt.edu/act-imagelink.pl?RC=46117 [retrieved April 1, 2015]. Original source: heqigallery.com. Shattered covenant, shattered world. New covenant, new world. A grain falling into the ground to die, yet bringing forth life. An exaltation upon a cross. A priest, like the cryptic figure of Melchizedek to whom Abraham gave a tithe, who is an eternal priest. A son made perfect through suffering. A priceless revelation of the heart of God come to abide in our hearts: “I treasure your word in my heart.” The way and will of God written on our hearts. The mountain range that was far off when we began this journey towards the Paschal Triduum, the three-day celebration of the cross and resurrection, draws ever nearer. The cloud and thunder at the mountain peaks echo across the plains. We hear the dramatic and transforming sounds of the coming days. Through Jeremiah, the prophet of doom, God promises a new beginning. That covenant created at Sinai, “I will be your God and you will be my people,” has been utterly and completely shattered. It lies on the ground like the broken walls of the city, the burnt cedar beams and collapsed stone of the temple, the gold and bronze and jewels stripped and added to the royal treasury of a foreign nation. Priesthood and Kingship ended. The people have betrayed the one who was a husband to them. Irredeemably. And yet: the promise of a new creation, a new covenant, a new day. And Jesus, by all accounts betrayed and broken, stripped and shamed, crushed and dead upon the timbers of a cross, yet exalted for all the world to see. For all the world to believe. For all to enter the world of living bread and new wine and the broken made whole and the blind now seeing. To enter the world of imperishable life. A high priest forever, writes the author of Hebrews, the source of eternal salvation. “With my whole heart I seek you,” sings the psalm. For our daily Lent devotion from Los Altos Lutheran church, and for sermons and other information on Lent see our Lent site. giving yourself to bring life to the world. “The days are surely coming, says the Lord, when I will make a new covenant with the house of Israel and the house of Judah.” – In the aftermath of the destruction of Jerusalem by the Babylonians, God promises to make a new covenant with crushed and scattered nations of Israel and Judah. Though they have betrayed and broken their covenant with God, God will start again, promising to write God’s commands on their hearts. “I treasure your word in my heart.” – A portion of the majestic hymn to the revelation of God’s will and way in the Torah, God’s word/law/teaching. “He became the source of eternal salvation for all who obey him, having been designated by God a high priest according to the order of Melchizedek.” – Jesus the faithful one has become our perfect high priest. “The hour has come for the Son of Man to be glorified.” – When Greeks come to “see” Jesus (see with faith), Jesus knows that the hour is at hand for him to be exalted/lifted up on the cross. He will lay down his life like a grain of wheat – and his followers also – for the sake of a rich harvest that gathers all people into life. There is no magic in the bronze serpent. No power in the image. The power is in the promise of God and their trust in that promise. I suppose God could have said, “stand on your head and you will be healed,” and it could have functioned in the same way, as an act of trust. But that would have been more magical than looking at the bronze serpent. For the bronze serpent is an image not only of the plague, but their own bitter, poisonous words. The bronze serpent is the truth of who they have become and what has happened to them. To look on the bronze serpent is to take the first step in rehab: to admit they are powerless over their addiction. It speaks the truth about themselves. We are vipers. We are a brood of snakes. We have become the offspring of the cursed one who turned our first parents from trusting God. And if the limp and broken body of the holy incarnation of God is not enough to convince you of this, then consider the masses of humanity that have been hacked, shot, stabbed, bludgeoned, hanged, gassed, poisoned, irradiated and burned to a crisp in the last century – or just allowed to perish from starvation. They are all present in the body of the crucified one. We are vipers. We are crucifiers. Healing and confession go together. There is no healing without truth. There is no requirement that the people feel badly about their bitter words against God. Confession is not about the feelings of guilt – it is about the objective reality of guilt. This is who they are. This is what they have done. Speaking that truth opens the door for God’s healing. But in the bronze serpent they are not only looking at the truth of their bitter tongues. They see not only the consequence of their rebellion. They see also the promise of God to forgive. God does not hold their sin against them. God wants to heal them. God wants to create faith and trust and fidelity in them. And so we can see why Jesus says he must be lifted up like the serpent in the wilderness. We, too, must see the fruit of our rebellion from God. We must see the truth of the violence in the heart of humankind. We must acknowledge the bitter poison on our tongues. We must recognize our distance from our true humanity. We must see the truth. But there, in the crucified one, we see also the promise of God to heal and forgive. There is no magic, here. The power is in that promise – and our trust in that promise. 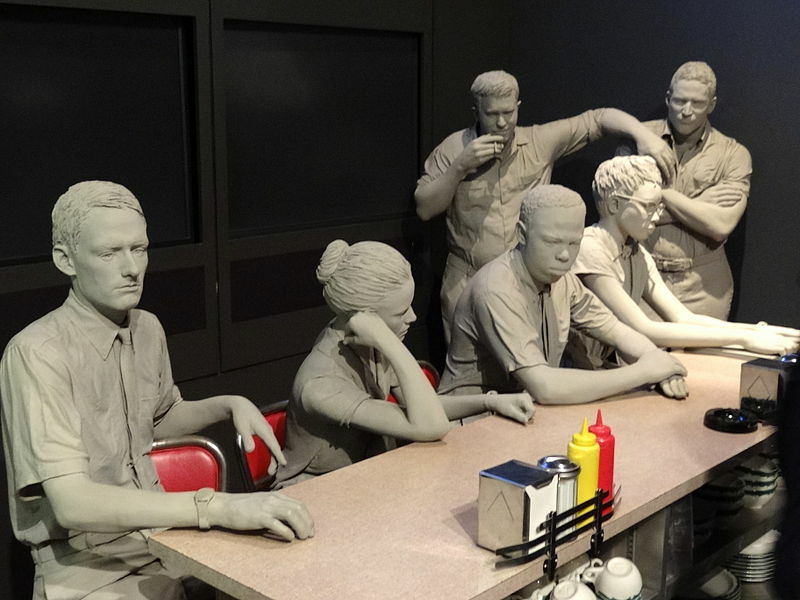 Diorama of Lunch Counter Sit-Down Protests – National Civil Rights Museum – Downtown Memphis – Tennessee. 34 He called the crowd with his disciples, and said to them, “If any want to become my followers, let them deny themselves and take up their cross and follow me. It’s important that we understand what it means to take up the cross. Jesus is not talking here about enduring the trials and tribulations of mortal life. This is not an exhortation to endure nobly a weak heart, a rebellious daughter, or a drinking husband. Life has many crosses to bear – but these are not the one to which Jesus refers. Jesus is headed to Jerusalem. There he will encounter the entrenched power and privilege of the wealthy elite who have made their alliance with Roman imperial power. They are the movers and shakers of their time – only they were not movers and shakers but preservers and defenders of the status quo. They would say, “Preservers of the peace,” but Jesus has suggested they are preserving their privilege not the way of God, the way of justice and mercy. An encounter with power can have only one outcome. They will do everything they can to shame and discredit and silence Jesus. Stripped naked, tortured, mocked – “Come on down if you are the Christ!” – and crushed. Powerless. Worthless. A worm not a man. Follow the Freedom Riders and you can expect spit and violence. Follow the young people at the “Whites Only” lunch counters and you can expect hate and vitriol (see photo). Speak up in their defense and you will incur the wrath of your neighbors. Those with any sense are silent. Those who would keep their jobs did not dare to register to vote during that Freedom Summer – or dare say that African-Americans had a right to vote. This is what it means to bear the cross. To endure the hostility, shaming and violence of the powerful because you stand on the side of the kingdom. The disciples are altogether unprepared to do this. 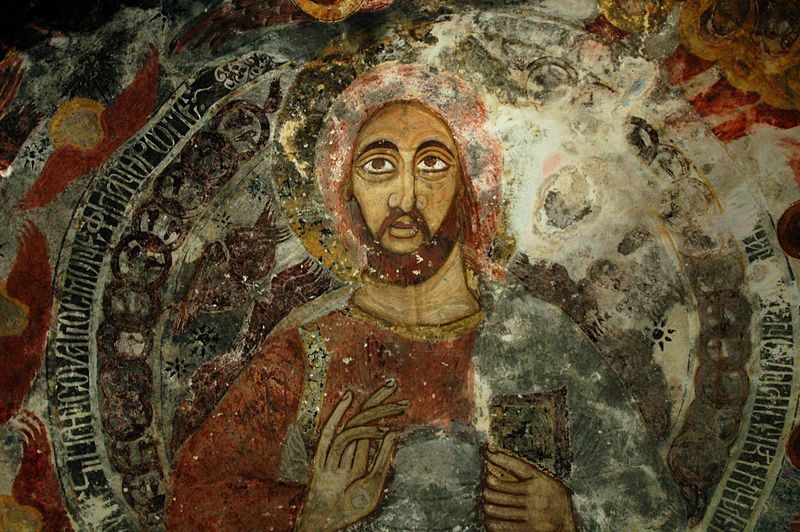 Peter rebukes Jesus for trying to suggest this is what Jesus will find in Jerusalem. But Jesus knows this is no victory march into the halls of power. The way to the kingdom involves a much more traumatic convulsion, a dying and rising – even as the path of becoming a disciple involves dying and rising. Peter will betray Jesus before he becomes the Peter who feeds Jesus’ sheep, before he becomes the Peter who heals the lame man at the temple, before he becomes the Peter who would serve God rather than man, who baptizes Cornelius the Roman Centurion, who is crucified upside down in Rome because he said he was not worthy of dying as Christ did. The soldiers gladly obliged. Letting go of life in order to find it. Letting go of the privileges of this world for the sake of the new world dawning in Jesus. Taking up the cross cast by a world that wants not to change, wants not to be born from above, wants not to die and rise. This is the awesome, terrible, holy, liberating journey of following Jesus.